Side control is one of those positions that is just plain horrible. Our opponent can mount attacks, we can’t, they can stall and rest, we’re carrying all of their weight, and they torque their weight into our necks. Needless to say it is not fun to be in bottom side control. What is also discouraging about the position is they can rack up points on our escape attempts with re-passes. If you’re in competition in the absolute division as a little guy, this is the last place you want to be. Someone who is not very skilled at Brazilian Jiu Jitsu can dominate someone in this position simply because of how strong it is. One of the most fundamental rules we are told over and over in our jiu jitsu training is to avoid showing our back and potentially allowing a back take and subsequent submission attempt. 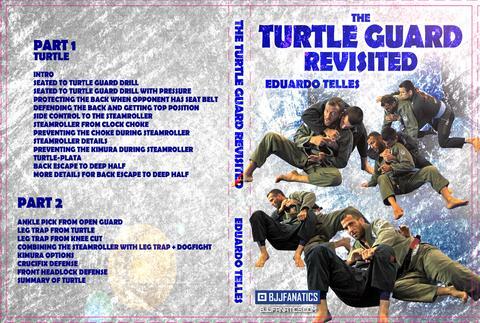 BJJ world champion and turte guard master Eduardo Telles turns this rule on its head and has created a complete game based on variations of the Turtle position where he will sit up and expose his back, to lure and trap his opponent with the back as his bait. Here are is a great way to escape side control that is very powerful: the steamroller escape as demonstrated by world champion and turtle guard master Eduardo Telles. Watch this one a few times, as it’s deceptively simple and will have your opponents salivating as you expose your back and slamming the mat when you reverse them with the steamroller.